This article is 2903 days old. The new Wyandotte Street East extension connecting Riverdale Ave. and Bellagio Dr. has been completed for a few months now. With its increasing popularity amongst commuters also comes an increase in speeding. Several residents in the area have stated that at times cars fly by due to the extension not having much traffic and being a fairly straight stretch. 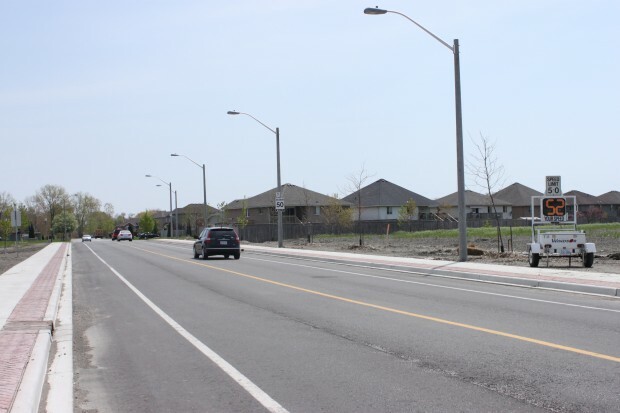 It’s a familiar trend that was also seen after construction of the McHugh St. extension near the WFCU center which saw many motorists receive speeding tickets. In order to reduce the number of speed demons heading down this stretch of Wyandotte, the City of Windsor set up a radar speed detector indicating how fast vehicles are driving. Residents have also said that more undercover police officers are patrolling the area to catch any speeders. One resident in the area said that this is the best method and will make people drive a bit slower as she compared this extension to the McHugh St. extension, saying that after police heavily patrolled the area for a few weeks people are obeying the limit more.